The beginning violin student and even someone with a few years of study might choose to purchase what is called a “violin outfit”. This is in contrast to separately purchasing the violin, bow, and the case. Why would a student (and the funding source, typically parents) go one route over the other? It is basically a matter of having strong preferences for characteristics of each component, versus not knowing why they would prefer one bow, one violin, or one case over another. And some of that has to do with simply how much tolerance the buyer has for shopping or confidence when entering a local violin shop and speaking with a violinmaker. These same considerations go for students of violas and cellos. It isn’t difficult to find violins for sale at a local shop, online or in one of the large chain music stores. Violas and cellos for sale are similarly easy to find. The challenge isn’t finding them as much as knowing which models to buy. For beginning players, it’s a good bet that an outfit put together by a local violin shop is going to be a good buy. Pricing of outfits – pretty much around $299 at the low end up to $2000 – is what makes them attractive as well. But that’s not to say individual components will necessarily cost more if purchased separately. All too often the pricing of an outfit might be misleading when, for example, available violins are of acceptable quality but the bow and case are subpar. Bow: For the beginner, a bow made of fiberglass is common and acceptable, although a student might also consider a carbon fiber bow because they are sturdy (sturdier than wood, which tends to be more expensive) and are less affected by temperature and humidity. More expensive are the Brazilwood and Pernambuco bows, although the Pernambuco (considered by many to be “the best”) are in short supply due to deforestation of the tree in its native Brazil (Brazilwood is derived from several species of available trees and as such is relatively inexpensive). 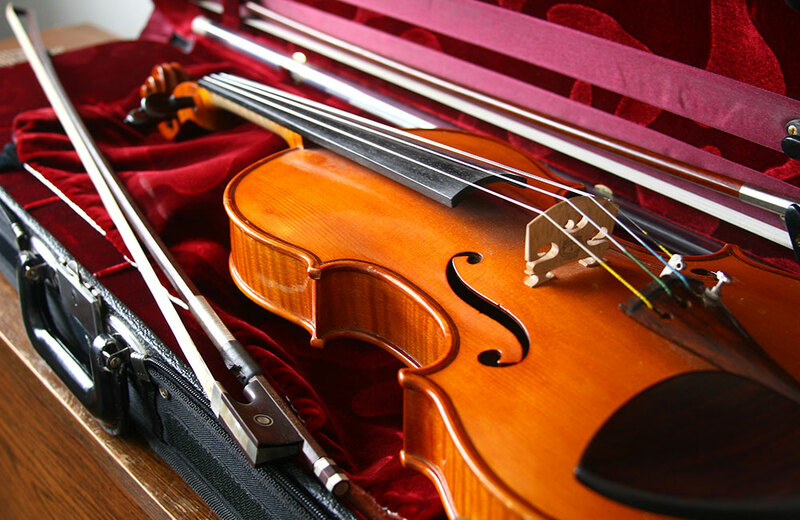 Case: A more expensive violin for a dedicated student might have a case with a built-in humidifier, thermometers and hygrometer (to check for humidity). But for students with a first violin, only the following should be a feature of the case: bow placement is secured to avoid contact with the violin, plus an extra compartment to hold rosin and a wiping cloth; interior padding with contours that mold to the shape of the instrument; hard exterior construction, made of wood, compacted foam, or carbon fiber. Soft-sided cloth carrying bags simply do not provide the same degree of protection. Violin: A student’s teacher might be the best guide in determining which beginner violin would work best. At the minimum, the strings need to be set right, neither too high nor too low. The pegs and fine tuners need to be operational. And the spacing of the strings, the “bow clearance,” should be such that the bow does not hit the edges of the instrument when the violinist is bowing the outer strings. The beginning student is also advised to find a luthier (violinmaker) who can determine where the student is at in his or her training. If the commitment is strong and there is some evidence of emerging talent, a smart strategy of investment in a good instrument, bow, and case might be in order. If the student has yet to demonstrate such qualities, a lower-priced violin outfit is perhaps the better choice.